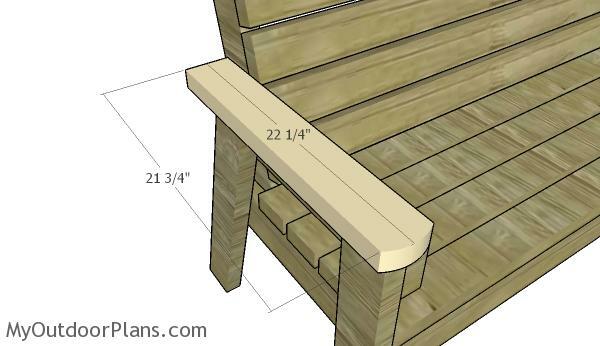 This step by step diy project is about 8 ft outdoor bench plans. 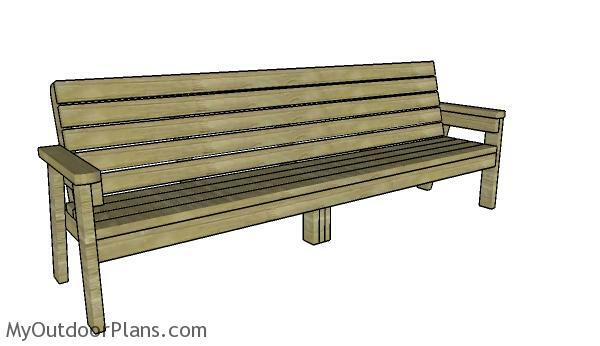 I have designed this long garden bench so you can hang out with your friends and family in your own garden. This bench features generous dimensions so you can have enough room in all directions. You can get the job done in one day using just 2x4s. Take a look over the rest of my woodworking plans, if you want to get more building inspiration. The first step of the project is to build the legs for the 8 ft outdoor bench. 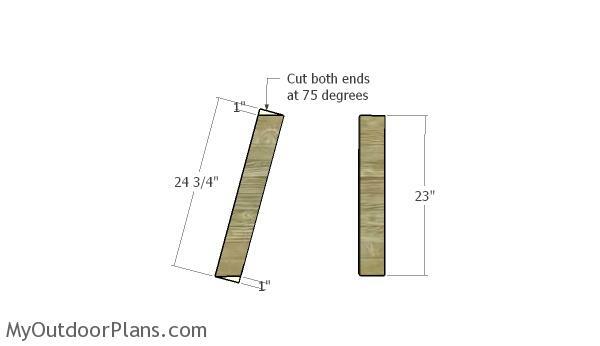 As you can see in the diagram, you need to cut both ends of the back legs at 75 degrees, using a miter saw. Smooth the cut edges with sandpaper for a professional result. 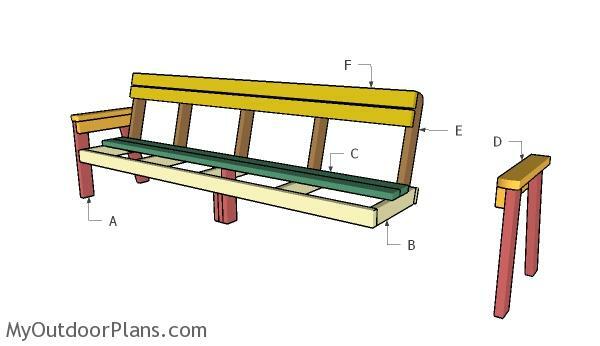 Next, you need to assemble the sides for the outdoor bench by attaching the armrest support. Cut one end of the support at 75 degrees. Align everything with attention, drill pilot holes and insert 2 1/2″ screws to lock everything tightly. In addition, add waterproof glue to the joints to reinforce the strength of the joints. Assemble the seat frame from 2×4 lumber. Cut the components at the right dimensions and align everything with great care. Drill pocket holes at both ends of the 18″ long supports and insert 2 1/2″ screws into the 96″ long components. Align the edges flush and make sure the corners are square. 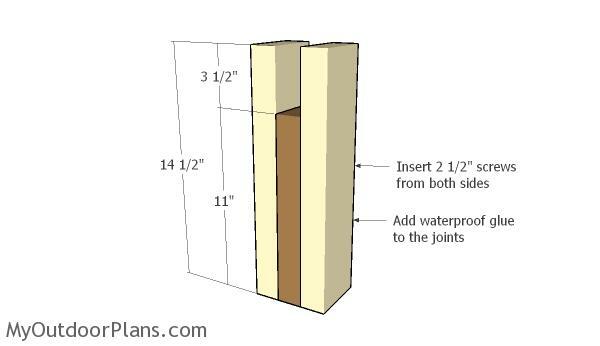 Add waterproof glue to the joints for a durable bond. As you can easily notice, you need to cut the back end of the middle seat supports at 75 degrees with a miter saw. Continue the project by assembling the outdoor bench. Drill pilot holes through the seat frame and insert at least two 2 1/2″ screws into each leg. 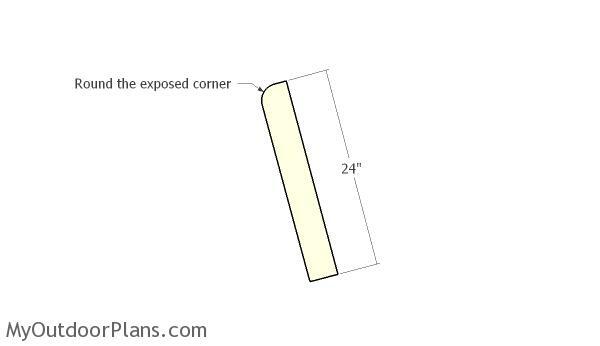 Use a spirit level to make sure the legs are plumb and check if the corners are right angled, for a professional result. 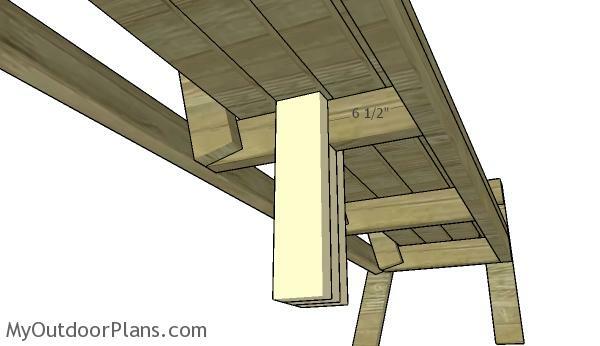 Build the supports for the backrest from 2×4 lumber. Round the exposed corner with a jigsaw and smooth the edges with sandpaper. Fit the backrest support to the seat of the bench. Align everything with attention, drill pilot holes through the bottom of the supports and insert 2 1/2″ screws into the seat frame. 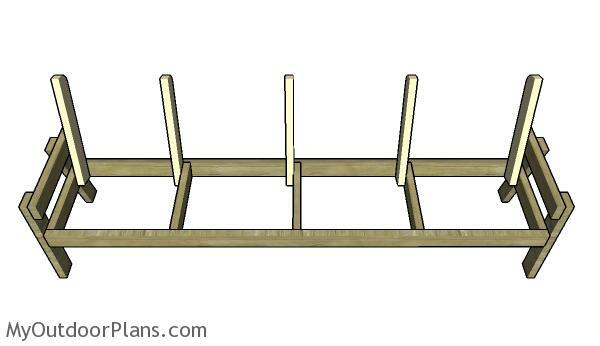 Attach the 2×4 slats to the seat frame, making sure you place them equally spaced. 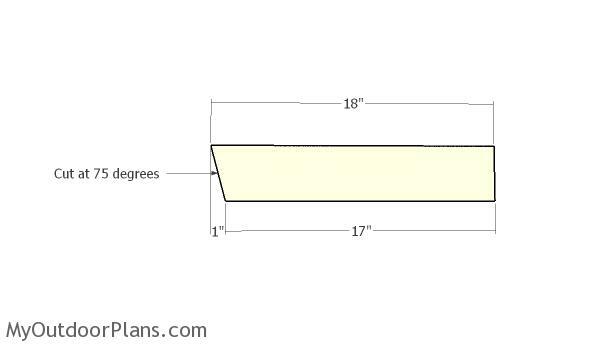 You can place a piece of 1/2″ plywood to make sure the gaps are even. 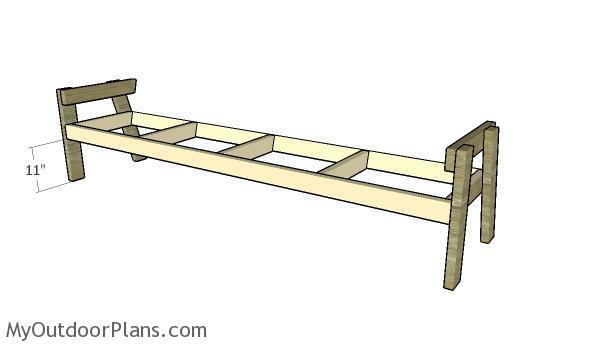 Continue the project by fitting the 2×4 slats to the backrest supports. 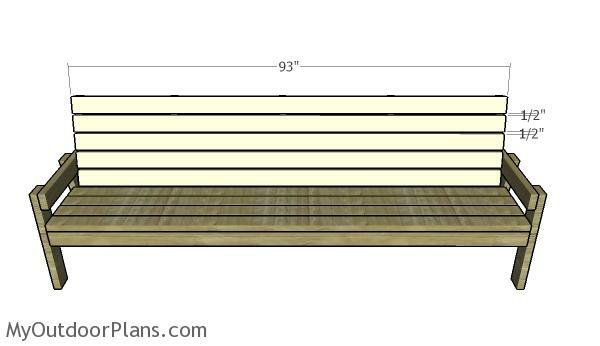 Start the installation of the slats with the top and go to the bottom, placing a 1/2″ spacer between the slats. Drill pilot holes and insert 2 1/2″ screws to secure the slats to the supports. 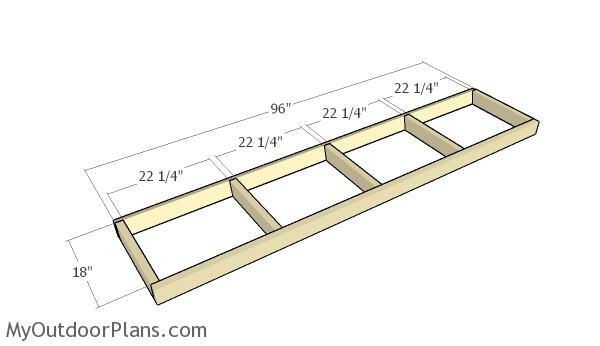 Build the armrests from 2×4 lumber, as well. Round the front of the armrests using a jigsaw. Smooth the edges with sandpaper and remove the excess with a damp cloth. In order to add extra support to the 8 ft long bench, you should install a leg to the middle of the seat frame. 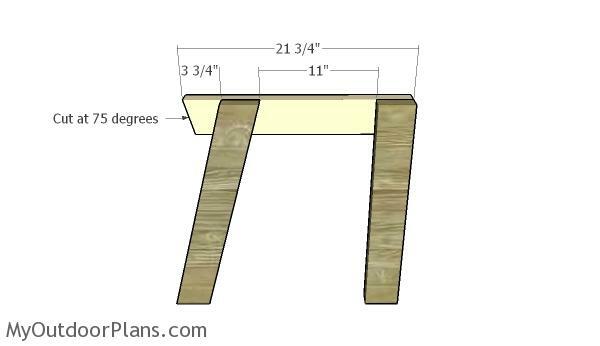 Cut the components from 2×4 lumber and assemble the legs with 2 1/2″ screws and glue. Align the edges with attention and leave no gaps between the components. Fit the leg to the center of the seat frame, as shown in the diagram. Drill pilot holes through the top of the middle legs and insert 2 1/2″ screws. Make sure the corners are square for a professional result. This is a simple project you should be able to build in a few hours without much effort. Remember that you need to adjust the size of the components so they suit your own needs. Don’t forget to check out the rest of my outdoor furniture projects, as I have designed lots of plans. 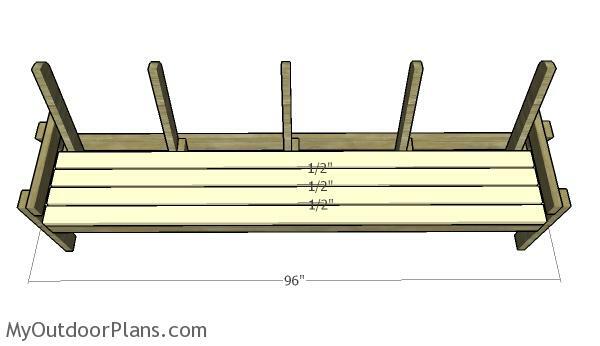 This woodworking project was about 8 ft outdoor bench plans free. If you want to see more outdoor plans, check out the rest of our step by step projects and follow the instructions to obtain a professional result. Is there an exact amount of screws that are needed for this project? 160 screws… -+ 10 Looking forward to seeing your project!